Lithophyte plant with short stem, completely enclosed by imbricating leaf-sheaths. Many roots, fleshy, flexuous, glabrous. Leaves very few, fleshy, elliptic, acute. Long 20 cm, wide 5 cm. Stalk thin and arcuate, as long as the foliage. Flower very few. Sepals elliptic-lanceolate almost identical, acute or sub-acuminate, at mucronate apex. Slightly elliptic, sub-parallel lateral sepals. Oblong-lanceolate petals, obtuse, slightly smaller than the sepals. Lip 3-lobed fleshy, almost rectangular lateral lobes. The apical half thickens of a callus. Disc between lateral lobes provided of a callus bifide with divergent tips follow-up of another callus bifide from the base of the midlobe. This one elliptic, acute. Column of 1 cm, cylindrical, base dilated . Pedicellate ovary of 2 cm long. Close to Phalaenopsis maculata, different by color, size and especially by the two lateral sepals divergent for this last, almost parallel for Phalaenopsis luteola. Yellow segments, brown stripped. Red Lip. Yellow lateral lobes. Described since 1880 by Burbidge in a publication which passed unperceived, kind of report of voyage. , The Garden of the Sun. The diagnosis, Latin description, who officializes the species is appeared in 2001 in the monograph devoted to Phalaenopsis from Christenson (page 135). 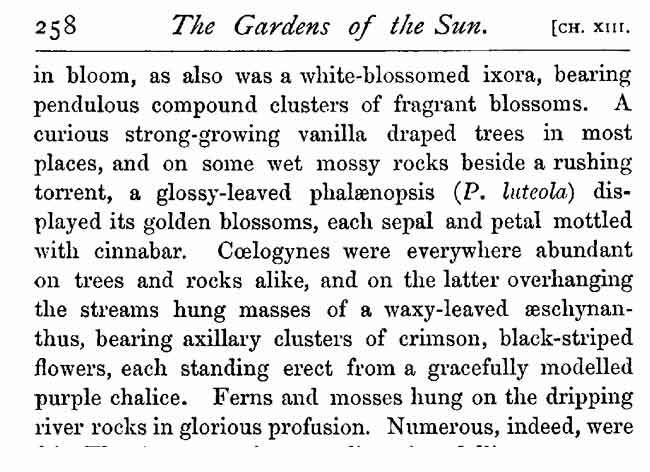 Some additional words from Rolf in the Orchid Review N°152 august 1905.